As part of a package of positive action to promote Tower Hamlets after the marathon, walking races and basketball tournament were moved from the host borough, Olympic organisers have named Brick Lane 'Curry Capital 2012'. Tower Hamlets dropped its legal action against London 2012 earlier this year, on the promise of concrete benefits and positive publicity for the borough including job opportunities targeting residents, the chance for young people to be involved in Olympic rehearsals and a media centre operating in the area during the Games. 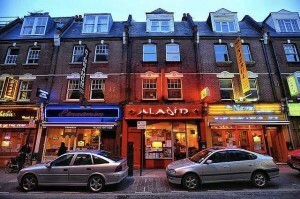 Of course, Brick Lane doesn't need Olympic endorsement to carry off the title of 'Curry Capital'. Also known as Banglatown, the area is a hub for the Bangladeshi community with its own Curry Festival and Mela. Whilst you can find great curry in other parts of town without the infamous fleet of curry touts in tow, there's no doubt that Brick Lane is synonymous with curry. But the official 2012 tag will give the whole of Brick Lane more prominence in the run up to the Games. The owners of Bar 2012, up the artsier end, must be delighted. Aside from dozens more media types descending on the street next year with money to spend, other tangible benefits include environmental improvements under the High Street 2012 scheme and the welcome news that Victoria Park — which is undergoing a £12m regeneration itself — has been named as one of four Festival Live Sites where the Games will be shown on al fresco big screens.